This is my new favourite winter salad. Cavolo nero (black kale), has an amazing depth of flavour and is surprisingly savoury, especially when roasted until crisp. Its bubble-like texture is beautiful, too, and makes for an eye-catching plate of food. I’ve boosted the cavolo’s natural savouriness by pairing it with Parmesan cheese, one of the world’s most famous sources of umami. The fact that they are two classic Italian ingredients makes this dish all the more satisfying. The cavolo nero is prepared in 3 different ways; steamed, finely chopped raw and roasted, so that the full range of flavour is maximised from this amazing vegetable. A selection of nuts adds to the savouriness and brings some extra texture. To counter the bold flavours and ensure that things don’t get too rich, I’ve added some finely sliced celery and a fresh tarragon vinegar dressing. Heat the oven to 180C and place a roasting tray inside to get hot. Remove and discard the tough inner stalks from the cavolo nero, then roughly chop the leaves into 2-3 inch long pieces. Once the roasting tray is hot, place one third of the cavolo nero in the tray and toss with 1 tablespoon of the olive oil. Season lightly with sea salt and place in the oven for 10 minutes. From the remainder of the cavolo nero, take a small handful and finely chop. Set this aside - it will go in the salad, raw, at the end. Take a frying pan or saute pan and place it over a medium heat. Add a little vegetable oil and, once it’s hot, add the remaining cavolo nero and season lightly with sea salt. Stir and fry for 30 seconds, then add the sliced garlic. Continue to fry for 30 more seconds then add a glassful of water. Cover with a lid or some kitchen foil and steam until the cavolo nero is tender. Check the cavolo nero in the oven. You want it to be crisp. If it’s not quite there then give it a toss and return to the oven for 5 minutes. When it’s done, remove from the tray and place on a plate lined with kitchen paper to drain. Put the steamed cavolo nero in a mixing bowl and allow to cool. Roughly chop the cashews and pistachios to be about the same size at the pine nuts, then place in a pan over a medium-high heat and add a small pinch of salt. Dry roast until lightly golden, then add to the mixing bowl. Finely slice the celery at an angle and add to the bowl along with the raw cavolo nero you set aside earlier. Add most of the parmesan, saving about a quarter of it to put on top at the end. Add 2 tablespoons of olive oil and the tarragon vinegar, then mix everything together. Taste and season with salt and pepper if necessary. It might need more olive oil and/or vinegar, too. 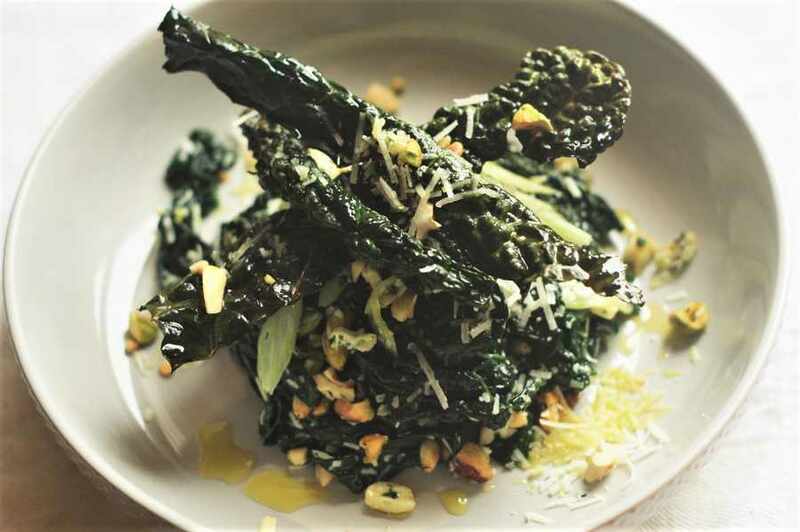 Serve in a bowl, with the crisp cavolo nero and the reserved parmesan on the top.